J has always loved stuffed animals--lions, bears, ducks--the softer, the better. When he was really small, he would pile them in the floor and fall asleep on top of them. His bed is filled with so many animals that there is barely room left for him to sleep in it. I tried taking some of them out, but after he was in bed at night he would just climb down and pull them back into the bed. This is what he does when he gets sleepy. 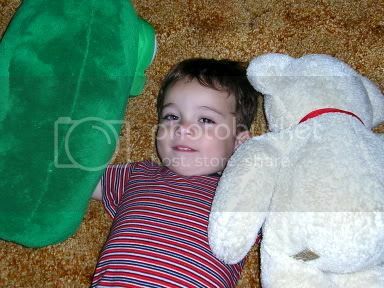 He still piles a few stuffed things in the floor and lies down wit them. Sometimes he'll say "night." He doesn't fall asleep like this anymore, but it is a good sign he is ready for sleep. Today I got this picture of him and his giant Larry and one of his many bears. It's not great because he wouldn't leave the light on--oh well.